The Bahamas are comprised of 700 beautiful islands and cays (pronounced "keys"), surrounded by pink and white sand beaches. 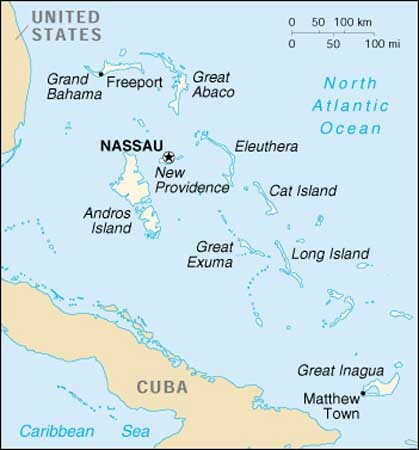 The islands start just Southeast of the tip of Florida, and Northeast of Cuba in the North Atlantic Ocean, although, the Bahamas are considered part of the Caribbean. While diving in the clear blue waters of the Bahamas, you will have the chance to dive on hundreds of wrecks or gorgeous reefs, surrounded by colorful fish, dolphins, and varieties of sharks. The Bahamas are in the Eastern Standard Time (EST) zone, and like the US, Bahamas observes daylight savings time during the months of April and October. The local language of Bahamas is English, however it may take a few minutes to get adjusted to the region's dialect/accent. High Season Winter: Oct. to Apr. Low Season Summer: May to Oct.
Hurricane Season: June to Nov. The Bahamas has an annual rainfall of approximately 45 inches, creating a tropical climate with average air temperatures ranging between 75-85 F. Light and casual clothing is suggested. Temperatures are generally 5 to 7 degrees cooler in the evenings, especially in the months of December through February. It is considered offensive/inappropriate to wear beach attire outside of the pool or beach area (i.e. city streets, churches, restaurants, and casinos). On smaller islands the dress code is a little more relaxed. Some restaurants may require the man to wear a jacket while eating. Average water temperatures ranging from 73F to 82F, and water visibility averages around 80 feet. 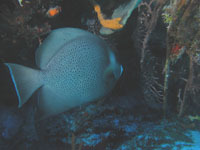 Outside of the hurricane season, the best time to dive in the Bahamas is any time! Taxis are available at the airport, as well as rental cars. When traveling by car in Bahamas, you will drive on the left hand side of the road. To rent a car, a valid national or international (English Language) driver's license is needed. If the driver's license is not in the English language, the visitor must carry a translation with the license. Some rental companies also have a minimum driver age of 21. The major car rental companies in the Bahamas include Avis, Hertz, Budget, and Dollar. When entering the Bahamas, U.S. and Canadian citizens are required to present a passport, official birth certificate, or original naturalization certificate, along with a return or onward journey ticket/e-itinerary. Citizens from countries other than the United States and Canada are required to present a passport (valid for six (6) months beyond the dates of travel), and/or a valid Bahamas Visa, along with a return or onward journey ticket/e-itinerary. When visitors arrive in the Bahamas, each will be required to fill out and sign an Immigration form, a portion of which will be held by the visitor until departure. When departing the Bahamas, those visitors departing to the US must go through US Customs pre-clearance. All visitors must present the remaining portion of the Immigration form that was given at arrival. Local currency in the Bahamas is the Bahamian dollar (B$1), which is equivalent in value to the U.S. dollar. Both U.S. and Bahamian dollars are accepted throughout the islands. The most commonly accepted credit cards are American Express, MasterCard, Visa and their affiliates. Monday-Thursday 9:30 a.m. - 3:00 p.m.
Bahamas has a modern telephone system that enables you to make local call and long distance calls. Mobile phones are available for rent, or with prior set-up you could bring your own mobile phone with you. BaTelCo has roaming agreements with many companies from the U.S., Canada and Mexico; for more information contact BaTelCo at www.betelco.com, or your service provider to activate international roaming while you are visiting Bahamas. The electrical current in Bahamas is 120 volts, 60 cycles, which is compatible with most American and Canadian appliances; however, surge protectors are recommended for sensitive equipment. It is recommended that you travel with adequate travel insurance. The Grand Bahama Island has a 100 bed hospital in Freeport, the Rand Memorial Hospital (community/public). * Mon-Fri 9:00 a.m. - 5:00 p.m.